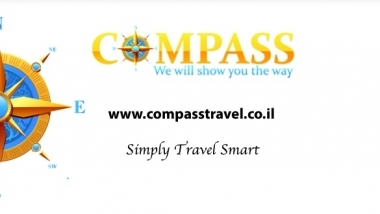 Compass Travel Israel Tours, Jerusalem Tel Aviv Herzliya , Israel. Information, Photos and Reviews. Israel Day Tours and Holy Land tour packages with Compass Israel. Collection of “must see” Israel Daily Tours. Daily tours to see Jerusalem Old and New cities. Bethlehem Manger Square. Visit Masada including Cable Car Ride, experience Dead Sea Therapeutic Mud and easy Float. Go to Israel Desert – Jeep Ride. Tour to holy Christian sites in Nazareth, Sea of Galilee, Jordan River Baptism site – Yardenit. Jewish Heritage – Golan Heights Kabbalah sites. Israel western coast tour to Caesarea Roman Amphitheater, Haifa Bahai Gardens, Akko Templar’s Tunnel. Tel Aviv Old Jaffa Port and much more. All Israel daily tours available in English, Spanish, German, French and Russian according to our schedule. Israel day tours include pick up & return service, government licensed tour guides, full transfers & entrance fees. Nobody has reviewed Compass Travel Israel Tours yet, Be the first. You are submitting a booking enquiry. Compass Travel Israel Tours will then contact you by email with details of availability and prices.